thank you so much!! :) I am happy you liked it! Message edited by author 2007-06-20 03:25:20.
flantastic, svetalana. i agree with soup about the highlights. it's a wonderfullly surreal image, one might almost dadaist. as usual, you've outdone yourself. Heh. I thought it was you. Glad to know I now recognize at least one person's style on DPC. :) Congrats on the nice score and placement! you are so creative! this is incredible! soup, thank you so much! excellent, i didn't think about it. great idea. only thought toward better would be a match of the highlights on the chair around your left arm. i think that would add a bit more depth, and dynamics. or was it a chair sitting like me? here we are, together with my chair, sitting and watching tv, or sitting and watching a movie in a theater. two circles = my hands, two circles = my feet, two circles = my eyes, two circles = above the chair, two circles = my head and the circle around my head. I obviously have something for chairs and balls, circles. I really like this picture, Svetlana. I don't understand it, so I gave it a 9 during voting, because I didn't see the connection to double take. But if I were voting on this as a Free Study, I would definitely have voted 10.
edit: After looking at it for a lot longer, I see that you are actually a double of the black chair. I guess the head and circles through me off on that realization earlier. I'm feeling really dense, because I don't understand the title either. Please realize that none of this is a criticism of the image, because it fascinates me and I really really like it. Message edited by author 2007-06-11 20:55:11. Did I call it? ;) Seriously, I really thought this would be top 10, not that 24th is anything to sniff at! You are far ahead of most of us that frequent DPC. Of COURSE we liked it :) It's incredible! What an awesome composition! I thought this was yours when thumbing through the entries (I didn't vote in this challenge). Extremely creative as always! You come up with ideas that would never occur to me in a million years. Very cool. Svetlana, you absolutely amaze me with your ideas. :) Nick, of course those are my eyes! Message edited by author 2007-06-11 02:47:11. I love how this is so alternative and how you just can't stop looking at it! Excellent! Arresting. (Can't begin to say how I think this works - magic circles?). Love looking. Weird works. WOO HOO - nice finish. Silverfoxx, you are a true artist. The most artistic shot I've seen yet. Silverfoxx? 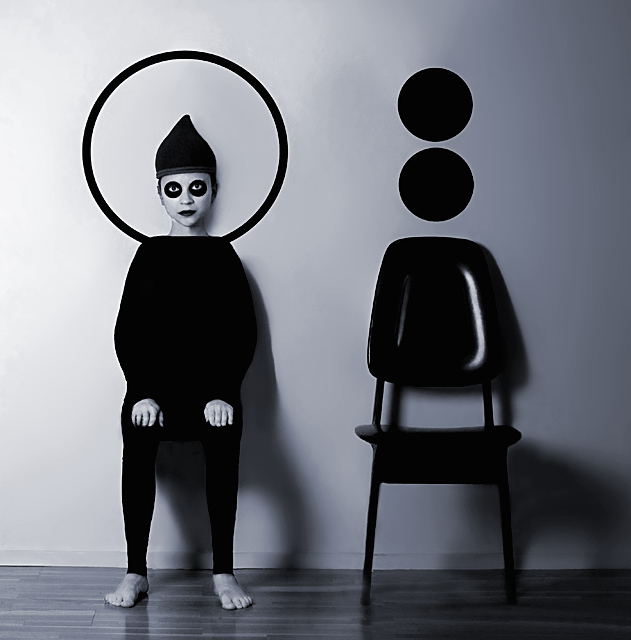 I just love the variations on theme here - how your body matches the chair's shape, the circles over the chair match your head's shape ... even the shadows are similar. best pic ive seen so far. Nice concept. Not too keen on the shadows as they seem to diminish the contrast. Creative, Felliniesque! Lighting could be better - I am disratcted by the gradient on the wall - it is a bit too dark on the right. This seems like something silverfox would produce. Very quirky and artistic. I know you! but this is so 10, believe me, I would have given this a 10 no matter who it was. intresting unique shot! I love the lighting. Greatly imaginative, though the technicals could use some improvement. Really needs better lighting (a fill or reflected light from the right, I think). So unique. Love the use of circles and the striking eyes. Love the black and white. this is art. nice job! By far the best photo in the entire challenge. Great picture. I love the compostition, the lighting and id jsut great! I absolutely love the "Out of the Box" thinking here. Very cool. This is a mezmorizing shot. It is difficult to look away from this. Nicely done. BUT... it could be the strangest picture i have seen in a while. wow, you never cease to amaze me. excellent composition!! nice, original concept. very artisty. Proudly hosted by Sargasso Networks. Current Server Time: 04/23/2019 08:00:00 PM EDT.